I am writing this review from the coalface of the 11 plus preparation zone – with one child in year 7 in her preferred choice of grammar school, and number 2 gearing up for exams in September. Pressure is mounting on him and on me to get him what he wants (and to equal his sister) , but I am finding he is a completely different individual and needs a bit more support from me to get the job done. So after two different experiences, here are some of my best tips for 11+ preparation. I favour some external tuition, because it gives structure and a framework for their home study. In our case I felt that my children would be more likely to absorb lessons given by someone else – they are inclined not to listen to me. Even with a tutor though, my husband and I felt we needed to be very involved. We looked at the papers ourselves and often sat with the children helping them through specific areas when they floundered. We wrote extra practice questions and cheered them on throughout the whole process. My daughter had a tutor right up until the day of the exam. this was partly because of the nature of the papers she was taking but also because it suited her. With my son, we let the tutor go at Easter and we are carrying on at home withthe help of home study materials which are widely available. You need to be very clear which papers your child will be sitting. In my case the syllabus for one of our preferred schools changed between my daughter’s exam and my son’s, and I am staggered to see how different the two papers are. There are plenty of study materials available for each of the main examining boards, but make sure that you double check what you are getting, as papers from the wrong examining board will not be at all helpful. 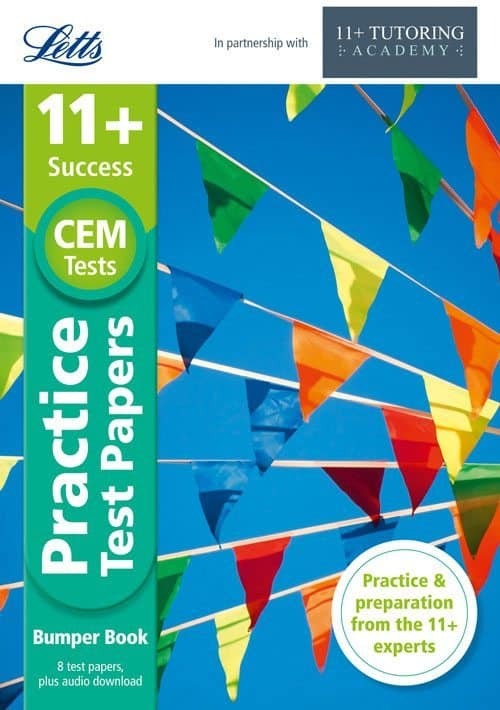 The nice people from Letts sent me a copy of one of their practice 11 plus papers range, and having looked at it and tried it out, I will be buying all of the remaining books in the Letts range for the CEM board, which is what he is sitting. My main focus has been to teach my children about exam technique and let the tutor teach them how to do the questions. Most children do not sit any exams of this type before the 11 plus. They need to understand how to fill the answer sheets in properly, what to do if they make a mistake etc. When my son did his first mock exam he wrote on the question paper not the answer sheet – I am glad he made that mistake beforehand and not on the day. Children also need to get used to the time pressured environment, so different from the classroom. Many children will not finish all sections, so if a question is too hard they should leave it and go on to the next because there may be easy marks at the end of the paper that would be a better use of their time. The only way to teach children about this time pressure is to let them do exam papers under timed conditions. Thankfully there are lots of papers available which come with typical answer sheets which the child can become familiar with. I found the Letts papers very good for this. They include tear out answer sheets that closely mimic the sort of sheets the children will fill in on the day. The answer sheets are very comprehensive too, giving the answer and some explanation of how it was reached – this can be very useful for parents , who may find as we did, that even they struggle with some of these concepts. My son seems to be enjoying these papers too. 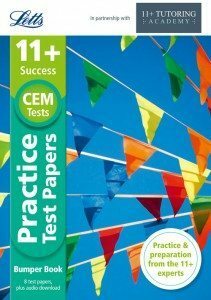 I don’t know whether it’s the bright colours of the cover or the way the tests are printed, but they are attractive and appealing and he finds them fun. Ihope he finds the real exam fun too – then my work will be done. Over the year of preparation, both of my children had periods of extreme over-confidence and periods of total self-doubt and stress. Some papers went badly wrong and I have had to pick up the pieces as the child realised that not everything was easy or obvious and some work was going to be required. The best learning happens when you go back over their mistakes and correct them, but constantly revisiting errors can be hard for some children and make them feel like a failure. To counter that make sure you give them lots of credit for the questions they have got right and reassure them that getting some answers wrong is perfectly normal at 11 plus. Above all I would recommend total sensitivity to the needs and character of your child. Sometimes you need to be coach, agony aunt and cheerleader as well as a parent, and sometimes all four at once. In my case I made sure that both children understood that failure was not the end of the world, but just a signpost to a different path. With one down and one to go I hope that this preparation will be enough for us and I look forward to seeing where my son gets to. 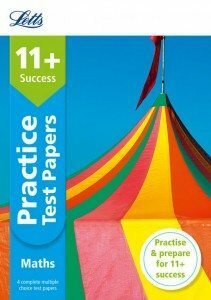 If you are looking to start your child’s journey to 11+ success I can heartily recommend the Letts range of study materials. I will post a comment on this blog in October and let you all know whether or not my son passed.